The difference between a wigwam and a tepee is that a wigwam is a permanent structure and a tepee is portable. 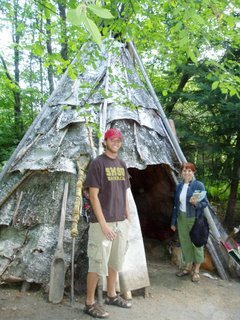 A wigwam, which is usually round-roofed or dome shaped, is covered with birch bark and sometimes packed with moss to provide added insulation from the winter cold. A tepee, which takes the conventional pyramid shape, is covered with animal skins which can easily be removed and packed. What you are looking at here is a wigwam in the shape of a tepee. 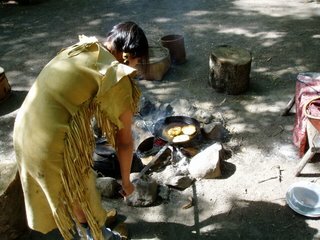 This photo was taken at the small Indian encampment near the fort. The participants recreate the lifestyle as authentically as possible. The research these young people do and the effort they put forth to recreate an authentic 1815 campsite and fort is just remarkable. Certainly young children would find this interesting. Actually, I found it quite interesting, but wished I had had more time to visit Ft. William. The fort contains 42 buildings. It was a fur trading fort only–not a military outpost–and it was really interesting to how it was set up. Here, still in the Indian campsite outside of the fort, a young woman fries bread, one of the staples of the time. We were able to taste it as well. It had a mild, bland flavor, with the consistency of a firm biscuit. 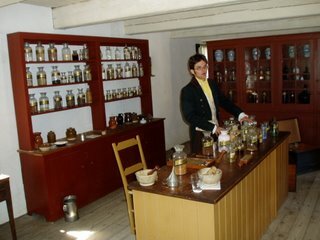 Of particular interest to me was the apothecary. The apothecary did everything medical–provided drugs, remedies of all sorts, dental work, surgery–everything! It was quite interesting to hear him describe how he handled various ailments. He also showed us his surgical tools (not shown–just ask if you’d like to see the pic). He took the time to explain how a tooth was pulled and showed us the tools to do it. He also spent some time on the practice of bleeding patients, a common practice at the time. In fact, what I found interesting was that he recommended the practice for healthy people as well, noting that many women of the time underwent the procedure to maintain a pale complexion, which was considered desirable in those times.